The popular online casino is challenging players to Go for Gold during its $150,000 Winter Olympics bonus contest as they award $30,000 in casino bonuses every week until March 3rd. Fortunately you don't have to be an Olympic athlete to take home a medal! 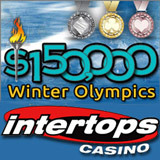 Intertops structures their promotions so everyone has a chance to win. Although frequent players can win bigger prizes, even once-in-awhilers are eligible for generous casino bonuses. Every Thursday the Go Farther, Move Faster draw will award bonuses up to $150 to players that have played Monday to Wednesday. Then, when it’s time for the closing ceremonies, three lucky players will be invited to step up to the winners’ podium as $1,000 Gold, $800 Silver and $500 Bronze medalists in the final Go for Gold draw.